Timothy Adam (Woodbury County) homestead file, final certificate no. 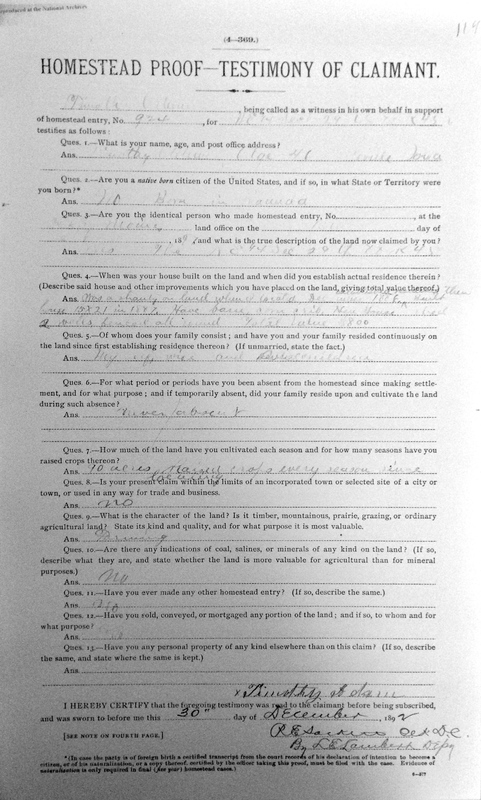 2560, Fort Des Moines, Iowa, Land Office; Land Entry Papers, 1800-1908; Records of the Bureau of Land Management, Record Group 49; National Archives, Washington, D.C. The Homestead Act was signed by President Abraham Lincoln on 20 May 1862.3 My first ancestor who took advantage of the one hundred and sixty acres offered to qualified applicants who lived on the land for five years and made specified improvements was Jens Madsen Schmidt, a Danish immigrant who settled in South Dakota in 1870.4 I had assumed that any ancestors who claimed homesteads in the years to follow would have had to journey even further west to find available land, but as it turns out, this was not necessarily the case. It would be sixteen years before Timothy would claim his homestead to the east, in northwestern Iowa. 1 Timothy Adam (Woodbury County) homestead file, final certificate no. 2560, Fort Des Moines, Iowa, Land Office; Land Entry Papers, 1800-1908; Records of the Bureau of Land Management, Record Group 49; National Archives, Washington, D.C.
2 Timothy Adam homestead file no. 2560, Fort Des Moines, Ia., Land Office, RG 49, NA-Washington, and 1895 Iowa State Census, Moville, Woodbury County, Iowa, Timothy Adam; digital image, FamilySearch (http://www.familysearch.org : accessed 21 May 2014), citing State Historical Society of Iowa, Des Moines. 3 Anne Bruner Eales, et al., editors, Guide to Genealogical Research in the National Archives of the United States (Washington, D.C.: National Archives and Records Administration, 2000), 293. 4 “Massachusetts, Marriages, 1841-1915,” digital image, FamilySearch (https://familysearch.org : accessed 30 Aug 2013), Timothy Adams and Julia Mellett, 22 September 1867, Springfield. Odile Millette used the name Julia early in her life. 5 1880 U.S. census, Hampden County, Massachusetts, population schedule, Springfield, enumeration district (ED) 321, p. 23 (handwritten), dwelling 127, family 204, Timothy Adam; digital image, Ancestry.com (http://www.ancestry.com : accessed 21 May 2014), citing National Archives microfilm publication T9, roll 536. 6 1900 U.S. census, Woodbury County, Iowa, population schedule, Sioux City, enumeration district (ED) 170, sheet 15-B, p. 77 (stamped), dwelling 291, family 333, Timothy Adam; digital image, Ancestry.com (http://www.ancestry.com : accessed 21 May 2014), citing National Archives microfilm publication T623, roll 467. 7 “U.S. Federal Census Mortality Schedules, 1850-1885,” digital images, Ancestry.com (http://www.ancestry.com : accessed 21 May 2014), entry for Abbina Adams [Albina Adam], March 1880, Springfield; citing “Nonpopulation Census Schedules for Massachusetts, 1850-1880,” National Archives microfilm publication T1204, roll 38. 8 Timothy Adam homestead file no. 2560, Fort Des Moines, Ia., Land Office, RG 49, NA-Washington. This entry was posted in Land Records and tagged 1880s, 1890s, Adam, family history, genealogy, homestead, Iowa, Massachusetts, Millette, Quebec on May 22, 2014 by Melanie Frick.